Labour’s managed to claw its way up towards the 40% mark and that’s good news for the Left, which is now back within striking distance of forming a government. There is however real cause for concern in the Greens remaining below the 5% threshold. This should be their election, and results like this suggest they need to do some serious work on their messaging. Damn left wing publication it’s lies all lies I tell you. On a more serious note I expect the greens will get over 5%, The Moari party to pick up all or all but one of the electorate seats and Winston to pull something out of the bag at the last minute. In case anyone is confused (as I was initially), National’s 49.9% equating to over 50% of the seats is because the Greens and NZ First votes are effectively lost votes (3.9 1.1 = 5%). This is because they don’t get over the 5% threshold or win an electorate seat. If accurate, this is not a good poll result for the centre-left. Whether Labour is cannibalising Green voters remains to be seen. Both the Greens and NZFirst will quite likely reach 5% (NZFirst less likely but that may not be even necessary with Tauranga). Both of these parties are more pro-Labour, whereas Peter Dunne/United Future is more pro-National. Part of this is probably due to the fact that the Greens do incredibly well on the special votes, and those people are unlikely to get polled. If accurate, this is not a good poll result for the centre-left. I’d disagree. The Greens will pass 5%, and National’s vote can only go down from 50. With Labour at around 40% there’s a good platform there for the Left to form a government around. The problem for the Greens is simple. In most other centers they poll 6-10%. In Auckland it’s under 2%, which pulls down the nett result. Aucklanders would by and large sooner die than use public transport. When they hear “climate change”, they decode it as “those mad greenie freaks want to take my beloved car off me”. It’s more or less that simple. RedLogix: I’m not sure. The Green Party actually does incredibly well in urban centres and its usual issue is with rural votes. That said, I’d certainly agree that Auckland is likely to be its least favourable city. With such outstanding logic you should be in our next Minister of Finance. Yes the details are interesting – and encouraging. Seems the poor old 40s Auckland males are most susceptible to the tory social handbrake/tax-bribe spin. Come on jaffa boys – lose those irrational fears and start living. Trust me, you don’t want to go back to the 50s or 90s. Greens and Labour only take votes of each other so not too much concern for the centre right there and the Moari party like Key more than Clark. The polling period for this poll was quite long (20 days) and the sample at the lower end of respectable. The colmar brunton that surveyed (as I recall) across the 6th of March to the 9th had a stronger right outcome. I’d be very interested to see how the results for the last week of polling for the Herald Digi compare to the results from the first week. Interesting stats too. Labour beat Nats in 2 age groups – the ones too young to know better and the ones who have lost there marbles 🙂 No surprises that National strongest supporters are the ones who pay the tax. The funniest result is ACT’s. The poll found no ACT supporters aged between 25 and 40. Not just a small number, but the smallest number. Less than one. Zero. As in, bugger all. After the blaze of publicity, the resurrection, the second coming … zero. Phone calls to that age group: hundreds. ACT supporters found: zero. As in, bugger all. Compare this poll result with a recent thread on Kiwiblog, where (no, I am not making this up) commenters claimed that evidence of strong support for Roger Douglas and ACT could be found in … the blog’s karma points. If you ever needed proof that Kiwiblog threads are a fantasy world, there you have it. But back in the real world: zero. As in, bugger all. 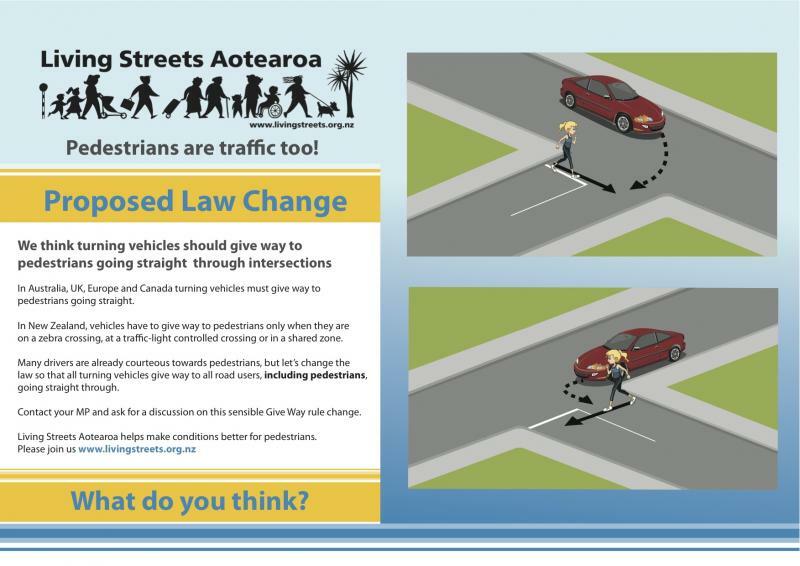 Shows how fickle Youth are – join the Auckland Uni ACT branch to get the free party pills then won’t vote ACT!!! Maybe they were too hungover to answer the survey when they got rung up. National has peaked too soon, and with Roger Douglas as an ally, the tax incentive shown up to be the lemon it is, no other policies of substance, Key shown up as somewhat flakey, it is all down-hill from here for the Nats. The Greens and Winston will come through, so I would agree a centre left coalition is likely. Unfortunately you’ve forgotten some notable other factors prior to the election, increased price rises in common goods, increased numbers of mortgages coming of fixed terms and exacerbating the pain in middle these will likely add to the voting public’s wish for a change. HS, the price of goods and the mortgage rise will continue regardless of who is in power. My worry is if Key’s appeal continues to drop and he trys to win with a mindlessly large tax cut, then the price rises under National would be even greater. I would agree about the Maori party: they will be more effective for their constituency by staying outside. The Maori Party party vote has picked up to the extent that it would be entitled to five MPs, adding a list MP to the four electorate members it has at present. Thanks for that. My 2% figure fails to break AK into areas, but then again I sort of recall some polling in the last few months that indicated Green support in the whole of Ak to be significantly lower than all other urban NZ areas. But your breakdown is revealing. After all the difference between say 2% in Manakau, and 12% in AK Central is a 6:1 difference in actual numbers voting for you. I predict the Maori Party will win all 7 Maori seats. But, even if they pick up 5, that will still be way more electorate seats than their party vote is likely to entitle them to. So, given that a party vote for Maori will be perceived to be a wasted vote, expect their supporters to split their votes like last time. What the Maori Party want to avoid is being backed into a corner due to a clear mandate from their supporters in favour of Labour. A smart move would be for the party to encourage supporters to use their party vote to vote Green. That would not only increase the Green’s chances(with whom they share more than a few commonalities), but could also give them more room to negotiate post-election. More fascinating was the Maori Party voting pattern and comparisons with other parties. 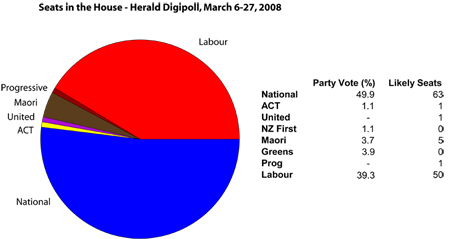 The library research concluded that in votes on bills in the current Parliament, the Maori Party voted 108 times the same as the Greens and 55 times differently; compared with Labour it voted 89 times the same as Labour and 80 times differently; and compared to National it voted 55 times the same and 112 times differently. 3.1.5 To honour Te Tiriti o Waitangi. Personally I wouldn’t get too excited until you see a month of polls and get some kind of trend. In any case you cannot rely on the numbers. I’ve commented on this previously. Problem is that phone polls are becoming obsolete. It doesn’t matter how much the polling companies fudge the figures to balance demographics – they are picking up on the trailing edges of the voting public. There are too many people that only run on cell-phones or don’t have a line at all. There are also a lot that have unlisted phone numbers. Lack of cellphones numbers under-represents the younger generations – around my apartment block, the people who have landlines and are under 30 (yeah I’m ancient right) consist mainly of heavy net users. Most of those use CID to screen the landline. If you’re worried about phone bills (ie poor), then the best budgetary thing you can do is to get a prepaid phone. I believe that in south auckland the landlines are about 40%, while in north shore it is closer to 80%. Conversely in the higher income brackets – well I made my number unlisted a long time ago – bastards target us using the census data. I notice that my more affluent friends are similarly dropping off the whitepages. Reduces the incidence of bloody telemarketers down massively. Personally I’d recommend it to everyone – takes about 3-4 years for the data to fall off the systems. But after that you get blessed peace. You can physically see it in the auckland phone book. Just got the 2008 white pages – it is slightly thinner than the 2007, which was thinner than the 2006, …… It has been reducing in size for at least a decade now. Anyway phone polls are rubbish, they’re good at tracking the more conservative, less stressed, and techno-phobic in society. Thats a reducing proportion. National’s support appears to be solid. A small drop but nothing to be overly concerned with. Labour’s support is heading back up to where it was in 1999, 2002 and 2005. There is nothing to suggest they will gain more support than they had in those three elections. Especially considering the state of middle New Zealand’s bank balances, I would suggest Labour can only hope to have the support they had in previous elections and not alot more. The left should be concerned. As the main stream parties adopt environmental policies that they luaghd at 15 years ago, they collectivley squeeze the greens. The green fight is winning and once it is won…..where do the Greens go. I can’t help but see the environment policies of the Nats as wolves reluctantly donning a sheepskin to hide their real intentions. Their long running complaints concerning the resource management processes and environmental controls suggest we will need the Green party as NZ’s conscience for a while yet. I think you are correct Dan but I would add both Labour and National are alot of talk and no substance. Our Record in the past 15 years is abysmal if you are a true greenie. But sometimes all you need is the rhetoric to get you through and that is why I think the Greens are in real trouble. Both parties are neutralising the green message by at the very least giving it lip service. On another point, March has been Nationals worst month since the last election. They will not be making those mistakes again. They should shread support now. If they don’t, then we can assume their support is fairly solid. I think Labour support will solidify at about 39 % there is no way the Green will get less then 5 that makes 44% with Jim and the overhang It is probably going to be LGM government which is going to be hard for a lot of people to take not least the National party which will split asunder, Which will be a shame buy Heh what can you do ? Why is there no way the greens will slip below 5%. Labour has more or less adopted their environment policies. So their only point of difference is loony leftie economic policies. With Labour you get acceptable environmental policies with sound economic policy. The Greens are in real danger for the simple reason they have won the argument and their biggest selling point is now accepted by 90% of Parliament. this result just goes to show what happens when the media bother to shine a light on National – their support starts to crumble and voters remind themselves that experience and competence is better than no policies and a millionaire PM. the Greens will do well this election off the back of the disaffected liberal vote if nothing else. that, the increasingly obvious significance of ecological issues, and the fact that small parties’ polling always troughs between elections, will see them easily over the threshold. How about some real discussion on how Labour (the workers party) treats workers. But as first-year Waikato Hospital doctor Michael Oehley, 24, said in a letter to the NZ Herald last week, when he broke his $61,000 salary into 55-hour weeks, subtracted tax and student loan repayments, “I get about $12 an hour for treating sick people after six years of studying”. Yep, look what 9 years of Labour govt extracting extra tax to fix health and education have achieved ! Labour are lucky to even get 39.3% – clearly a lot of people take no notice of the complete shambles Labour have created in their quest for power at any price. I was talking to a guy last night who worked in communist Poland a few years back. He had a friend who was a surgeon who left Poland for the US after being completely fed up with only earning 10% more than the hospital cleaners. $12/hour after tax is probably only 10% more than the cleaners in NZ hospitals earn, might even be less than the cleaners team leader! Actually if the cleaners in NZ hospitals spent 6 years producing a family rather than studying to be a Dr they would be getting more per hour than the Dr once WFF benefits are taken into account. WTF is going on in this country? How can anybody who’s got even a slither of intelligence think things are heading in a good direction? The hospital cleaners do play an important part in any hospital, however to say it is just as important as the part played by doctors is patently absurd. Tee hee! Were you thinking of Mr Key? The problem is more complex than comparing $60 to $58. The starting Dr’s salary as highlighted above ( $61,000 ) is the issue. It’s an issue effecting Labour’s polling as much as the cleaners earning a disgustingly low $12/hour is effecting Labour polling. The $12/hour is disgusting because it’s a pittance compared to the cost of living. The $61,000 is more interesting. To convince ourselves that Labour tax policy is good we need to believe $60,000 is a lot of money to earn in a year. (is it even 20% of what the PM earns???) If we believe this we have no issue with calling Dr’s earning $61K rich pricks and cleaners earning $12/hour poor. Thus we can feel comfortable offering generous welfare to the $12/hour earner. This welfare is extracted from the rich pricks like new Dr’s earning $61,000 a year. Such strong redistribution policies enable employers to continue paying $12/hour – IE: The cleaners keep turning up to earn their low wages which give them entitlement to good welfare. Why would a Dr stay employed in the NZ public health service when they are denigrated for earning 2-3 times what a cleaner earns. While being denigrated as rich they are paying excessive taxation to attempt to redistribute across such a narrow margin of ‘acceptable earning’. Then we wonder why wages are not rising as quickly as inflation… Doooh. As you are a strongly union affiliated person I’d be interested to hear your opinion of Dr’s earning $61,000 a year working 55 hour weeks. Do you think we can compare the NZ and the Aussie public health services to Bunnings? Should we be protesting that a Labour govt in NZ pays so little to Dr’s compared to a Labor govt in Aussie? Actually – the most interesting aspect of that doctors story is that he’s working 55 hours per week. This is blatantly stupid. My nephew has been told by his doctor not to work any more than 45 hours per week simply because it’s killing him. I’m pretty sure the same could be said for doctors who are under a hell of a lot more stress. National’s policy to correct this seems to be to have them work even more by capping the bureaucracy. Oh, should also point out that the doctor is getting paid $12/hour after tax and student loan. The cleaner working 55 hours and getting $12/hour after tax et al (I don’t know of any cleabers who actually get this much) would also be on $61k/year and so would also be considered a ‘rich prick’. Well, actually, they wouldn’t be but they would be paying the same tax as the doctor. It is not unusual for junior Drs to work 55hrs per week many work more this has been the case for as long as I can remember. You also state that National’s policy is to have them work harder by capping the bureacracy this is wrong as they have stated, I believe, they will not cut front line staff in health education etc. I think you would find that most medical staff would find being classed as bureaucracy as insulting as per Peter Dady in todays paper (this is a view that many of us have sympathy with). HS, do you think that reducing the number of backroom staff will actually, in reality, reduce the number of backroom work that needs to be done? If not, who do you think will end up doing it, if not you and your colleagues? I think the critical question is what really is the amount of backroom and Ministry work that needs to be done. As a very simple example why does a country of 4 million need 21 DHBs ? Reading those comments in the SST, I was struck by their thoughtfulness. Why, all we need to is institute common sense systems, and eliminate stupidity. Brilliant! I guess that would be something like “sick people should get the necessary treatment from the medical system to help them get better”. That’s common sense. What on earth is this “backroom” work that needs to be done? Apart from culling patients from waiting lists to make this corrupt govt look better than it actually is I cannot think of anything that could justify the huge growth in the bureaucracy. i can’t wait for when you’re fired BB, you’re such a bore. Agreed, so perhaps you should just stick to reading for a year or twelve, and spare us all from your boring lack of thought. Burt, in response to your query, I honestly don’t know enough about the pay scales of junior doctors or what their job involves to make an informed comment. Actually, most jumior doctors have ambitions to one day become specialists so there’s alot to be said for them working as much as possible so they can climb the ladder in the shortest amount of time. It’s only when you graduate from university as a doctor that you really start your apprenticeship. The real learning happens on the job. When I was a builders apprentice back in the early 90’s we often worked 10 hour days, but none of us complained as we were learning and getting our hours up. I shouldn’t be surprised if that happens in most fields, not just for doctors. it’s just part of being young and working your way up. How would that doctor be better off under National? It was Labour that introduced interest free student loans. National only wants to cut spending in the public service. However, I agree we do have a major problem retaining doctors in NZ. I think we should have a policy that if doctors trained in NZ remain in NZ they get big reductions on their student loans, or have the loans wiped altogether. The cost of medical education is too high. However, $61,000 isn’t bad for a 24 year old and it tends to go up pretty quickly with experience. I’m surprised that you think this is patently absurd. Surely this is the crux of your Marxist doctrine: that the factory worker is just as important as the factory owner, and that skimming the earnings of the â€˜rich pricks’ and topping up the pay packets of the ‘poor pricks’ is the only way we can have a truly equal society. Or are you acknowledging that those who study hard at school and work hard in the careers should be justly recognised – and rewarded – for their hard-earned efforts? The chief problem with most political polls, one that is poorly understood and never articulated in newspaper reports, is the default assumption that underpins sample size calculation. A polling sample size is determined by the choice of margin of error and a sample size of 700-800 will deliver a margin of error of 3%-4%. But this margin of error is based on the assumption that the poll is a two horse race ie will the voter go with National or Labour. No New Zealand poll I have seen is powered to accurately address what is, in essence, a subgroup analysis ie what percentage of the population will vote for the minor parties. Therefore the response to Policy Parrot’s implied question is that any poll with a sample size based on a the assumption of two horse race will not tell you anything useful about the other horses. A different sample size calculation is needed and will probably result in larger sample size to address the question of minor parties. Jameson are you accusing me or OOB of being a marxist – I can’t speak for OOB but I can assure I’m not. Would you like to explain to OOB – and the many here who think it’s patently sensible – why his statement is ‘patently absurd’?